A woman named Carla was recently on a segment of Must Love Cats from Animal Planet. She introduced her Custom Suits for cats - for cats with spraying problems (Stud Suit) or one who are obsessive groomers or recoverying from a surgery. 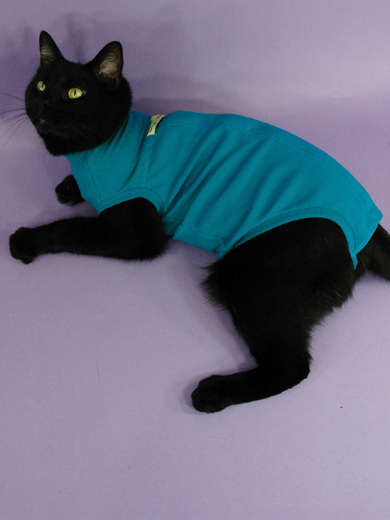 The Meow Wear Custom Post-Surgical Suit is usually sold to people who have obsessive groomers. 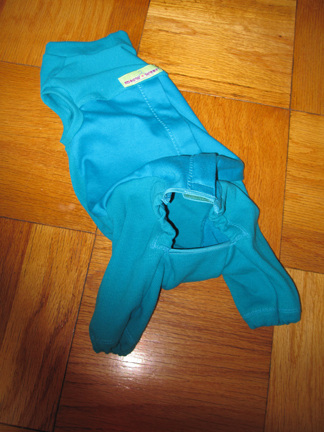 It is a cotton-poly knit bodysuit, open at the back for elimination needs. It is machine washable, and has a double thickness of fabric on the belly. The basic suit is $65.00, including domestic shipping; if you need legs added to the suit, they are an additional $10.00 per pair. The Stud Suit is basically the same thing (single thickness on the belly), but with a rear panel in which you can adhere a small sanitary pad or a pet diaper. It allows for defecation, while absorbing urine/spray. Neck: measure around neck where a pet collar would be worn. Girth: measure around body over ribs and again in front of the back legs. Back Length: measure from the collar location, down the back, to the base of the tail. Take this measurements several times to assure you are correct. Your cat should be in a relaxed, standing position - NOT bending, stretching, eating or curled up. The suit is made-to-order, and therefore, not returnable. Her current color selections are red, kelly green, navy, royal blue and yellow. She accepts Pay Pal (input payment to: info@meow-wear.com) or personal checks. We at the Cat Rescue Network thought Carla's ideas where innovative to common issues with cats. To visit her website, you can access it at www.meowwearcustom.com.